Young children in preschool and kindergarten learn special skills like learning letters, counting to 100, memorizing their home address, and writing their names. 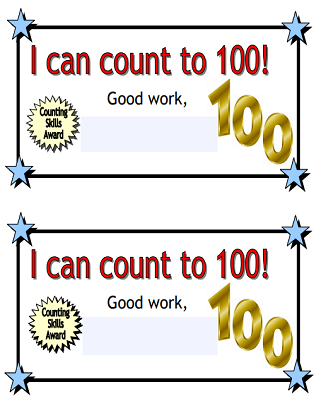 The award certificates on this page can be printed out to recognize their progress with these skills. See also: Printabe Awards for elementary school children. For being able to tie shoe laces independently. For counting all the way up to one hundred. I can write my full name! For being able to write my full name! I know my home address! For knowing the address of your home. I know my right from my left! For distinguishing between left and right. For being able to fasten buttons. I can zip a zipper. For being able to zip a zipper. I know the 7 days of the week! For being able to recite the seven days of the week. I can sing the ABCs! For being able to sing the alphabet song. I can write my ABCs! For being able to write out the letters in the alphabet. I know a phone number to call a parent. For being able recite a parent's phone number. I know what number to call if there is an emergency. For knowing how and when to dial 9-1-1. I know how to log in to the computer all by myself. For being able to log into the computer. Assessment: Am I Ready for Books? Ten oral questions for students to determine if they are ready for books. Includes identifying characters with pictures, identifying the front cover, and left-to-right reading skills. 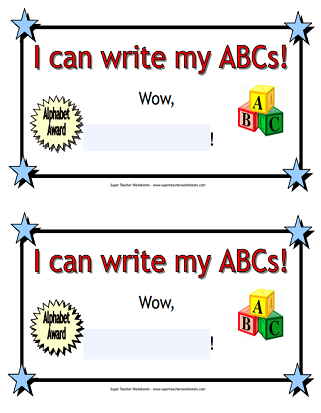 Printable certificates and awards for math, writing, reading, spelling, and more.